Back row (l to r): Francisco Bello (A’05), Carmi Bee (AR’67). Center row (l to r): Lea Cetera (A’05), Robin Schavoir, Nelson Figallo (AR’03), Steven Hillyer (AR’90). Front row (l to r): Michael Blackwood,MaryAnn Nichols (A’68), Patty Jenkins (A’93), Shelley Eshkar (A’93), Janet Gardner (A’65), Neal Slavin (A’63). Films written, produced, directed, created or about Cooper Union alumni were screened over four weekends during the inaugural Alumni Film Festival. Features, documentaries, shorts, animation and experimental and fantasy narrative films demonstrated the diversity of the creative work performed by Cooper Union alumni of all disciplines. The film festival was developed by a committee of alumni and staff in collaboration with the Office of Alumni Relations. Co-chairs Carmi Bee (AR’67), Lea Cetera (A’05) and Neal Slavin (A’63) worked with Kathryn McGraw Berry (AR’80), Rocco Cetera (CE’99), Janet Gardner (A’65), Director of the Irwin S. Chanin School of Architecture Archive Steven Hillyer (AR’90), Associate Dean of the School of Art Steven Lam, Director of Alumni Relations Susan Moyle Lynch and Manager of Alumni Outreach and Events Madeline C. Kilroe. 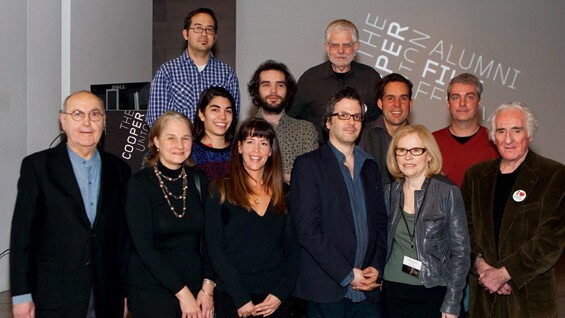 The festival kicked off on January 28, 2011 in the Frederick P. Rose Auditorium in 41 Cooper Square with the short After Ghostcatching, with visuals and sound by Shelley Eshkar (A’93) and Focus, directed by Neal Slavin. Screenings continued through February 26 and attracted 566 attendees, including alumni, staff, faculty, students and members of the community. “[The films in the festival] are of special interest because they are coming from visual artists (with the exception of a few architect filmmakers) who began as painters, sculptors, photographers,” Cetera said. “Because of this, in many cases you will get really groundbreaking and interesting work that you don’t find in other film programs. Cooper students tend to experiment, push boundaries and think differently. Q&As were presented with several screenings, including with Milton Glaser (A’51) following a screening of Wendy Key’s Milton Glaser: To Inform and Delight, and director Patty Jenkins (A’93) following a screening of her critically acclaimed film Monster. Documentaries included John Hejduk: Builder of Worlds, directed and produced by Michael Blackwood, featuring former Architecture Dean Hejduk (AR’50) conversing with poet David Shapiro about the mystery and spirit of architecture. Significant contributions by Cooper alumni to the evolution of film were also showcased, including work by the late animation pioneer Max Fleischer (A’1900) and experimental media artist Stan VanDerBeek (A’56, Dec.). Filmmakers interested in being considered for a future festival may contact alumni@cooper.edu.